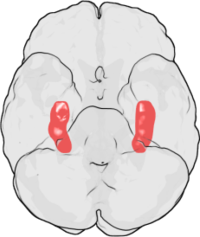 Different areas of the brain exhibit different forms of LTP. 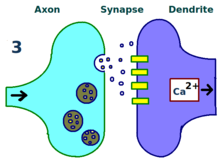 The specific type of LTP exhibited between neurons depends on a number of factors. One such factor is the age of the organism when LTP is observed. For example, the molecular mechanisms of LTP in the immature hippocampus differ from those mechanisms that underlie LTP of the adult hippocampus. The signalling pathways used by a particular cell also contribute to the specific type of LTP present. For example, some types of hippocampal LTP depend on the NMDA receptor, others may depend upon the metabotropic glutamate receptor (mGluR), while still others depend upon another molecule altogether. The variety of signaling pathways that contribute to LTP and the wide distribution of these various pathways in the brain are reasons that the type of LTP exhibited between neurons depends only in part upon the anatomic location in which LTP is observed. 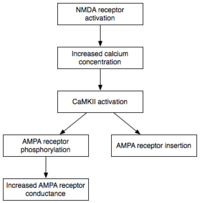 For example, LTP in the Schaffer collateral pathway of the hippocampus is NMDA receptor-dependent - this was proved by the application of AP5, an antagonist to the NMDA receptor, which prevented LTP in this pathway. Conversely, LTP in the mossy fiber pathway is NMDA receptor-independent, even though both pathways are in the hippocampus. Upon activation, ERK may phosphorylate a number of cytoplasmic and nuclear molecules that ultimately result in the protein synthesis and morphological changes observed in L-LTP. These cytoplasmic and nuclear molecules may include transcription factors such as CREB. ERK-mediated changes in transcription factor activity may trigger the synthesis of proteins that underlie the maintenance of L-LTP. One such molecule may be protein kinase Mζ (PKMζ), a persistently active kinase whose synthesis increases following LTP induction. PKMζ is an atypical isoform of PKC that lacks a regulatory subunit and thus remains constitutively active. Unlike other kinases that mediate LTP, PKMζ is active not just in the first 30 minutes following LTP induction; rather, PKMζ becomes a requirement for LTP maintenance only during the late phase of LTP. PKMζ thus appears important for the persistence of memory and would be expected to be important in the maintenance of long-term memory. Indeed, administration of a PKMζ inhibitor into the hippocampus of the rat results in retrograde amnesia with intact short-term memory; PKMζ does not play a role in the establishment of short-term memory. PKMζ has recently been shown to underlie L-LTP maintenance by directing the trafficking and reorganization of proteins in the synaptic scaffolding that underlie the expression of L-LTP. Even more recently, transgenic mice lacking PKMζ demonstrate normal LTP, questioning the necessity of PKMζ. ^ a b Cooke SF, Bliss TV (July 2006). "Plasticity in the human central nervous system". Brain. 129 (Pt 7): 1659–73. doi:10.1093/brain/awl082. PMID 16672292. ^ a b Bliss TV, Collingridge GL (January 1993). 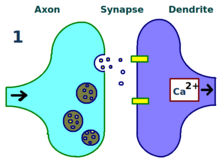 "A synaptic model of memory: long-term potentiation in the hippocampus". Nature. 361 (6407): 31–9. Bibcode:1993Natur.361...31B. doi:10.1038/361031a0. PMID 8421494. ^ a b Santiago Ry (1894). "The Croonian Lecture: La Fine Structure des Centres Nerveux". Proceedings of the Royal Society of London. 55 (331–335): 444–468. doi:10.1098/rspl.1894.0063. ^ Hebb DO (1949). Organization of Behavior: a Neuropsychological Theory. New York: John Wiley. ISBN 978-0-471-36727-7. ^ a b Lømo T (April 2003). "The discovery of long-term potentiation". Philosophical Transactions of the Royal Society of London. Series B, Biological Sciences. 358 (1432): 617–20. doi:10.1098/rstb.2002.1226. PMC 1693150. PMID 12740104. ^ Lømo T (1966). "Frequency potentiation of excitatory synaptic activity in the dentate area of the hippocampal formation". Acta Physiologica Scandinavica. 68 (Suppl 277): 128. ^ a b Bliss TV, Lomo T (July 1973). "Long-lasting potentiation of synaptic transmission in the dentate area of the anaesthetized rabbit following stimulation of the perforant path". The Journal of Physiology. 232 (2): 331–56. doi:10.1113/jphysiol.1973.sp010273. PMC 1350458. PMID 4727084. ^ a b Bliss TV, Gardner-Medwin AR (July 1973). "Long-lasting potentiation of synaptic transmission in the dentate area of the unanaestetized rabbit following stimulation of the perforant path". The Journal of Physiology. 232 (2): 357–74. doi:10.1113/jphysiol.1973.sp010274. PMC 1350459. PMID 4727085. ^ Douglas RM, Goddard GV (March 1975). "Long-term potentiation of the perforant path-granule cell synapse in the rat hippocampus". Brain Research. 86 (2): 205–15. doi:10.1016/0006-8993(75)90697-6. PMID 163667. ^ Andersen P (April 2003). "A prelude to long-term potentiation". Philosophical Transactions of the Royal Society of London. Series B, Biological Sciences. 358 (1432): 613–5. doi:10.1098/rstb.2002.1232. PMC 1693144. PMID 12740103. ^ McEachern JC, Shaw CA (June 1996). 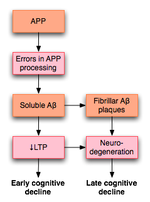 "An alternative to the LTP orthodoxy: a plasticity-pathology continuum model". Brain Research. Brain Research Reviews. 22 (1): 51–92. doi:10.1016/0165-0173(96)00006-9. PMID 8871785. 8871785. ^ Clugnet MC, LeDoux JE (August 1990). "Synaptic plasticity in fear conditioning circuits: induction of LTP in the lateral nucleus of the amygdala by stimulation of the medial geniculate body" (PDF). The Journal of Neuroscience. 10 (8): 2818–24. doi:10.1523/JNEUROSCI.10-08-02818.1990. PMID 2388089. ^ a b c d e f g h i Malenka RC, Bear MF (September 2004). "LTP and LTD: an embarrassment of riches". Neuron. 44 (1): 5–21. doi:10.1016/j.neuron.2004.09.012. PMID 15450156. ^ Yasuda H, Barth AL, Stellwagen D, Malenka RC (January 2003). "A developmental switch in the signaling cascades for LTP induction". Nature Neuroscience. 6 (1): 15–6. doi:10.1038/nn985. PMID 12469130. ^ Collingridge GL, Kehl SJ, McLennan H (January 1983). "Excitatory amino acids in synaptic transmission in the Schaffer collateral-commissural pathway of the rat hippocampus". The Journal of Physiology. 334: 33–46. doi:10.1113/jphysiol.1983.sp014478. PMC 1197298. PMID 6306230. ^ Harris EW, Cotman CW (September 1986). "Long-term potentiation of guinea pig mossy fiber responses is not blocked by N-methyl D-aspartate antagonists". Neuroscience Letters. 70 (1): 132–7. Bibcode:2006NeuL..400..197D. doi:10.1016/0304-3940(86)90451-9. PMID 3022192. ^ Wigström H, Gustafsson B (1986). "Postsynaptic control of hippocampal long-term potentiation". Journal de Physiologie. 81 (4): 228–36. PMID 2883309. ^ Urban NN, Barrionuevo G (July 1996). "Induction of hebbian and non-hebbian mossy fiber long-term potentiation by distinct patterns of high-frequency stimulation". The Journal of Neuroscience. 16 (13): 4293–9. doi:10.1523/JNEUROSCI.16-13-04293.1996. PMID 8753890. ^ Kullmann DM, Lamsa K (March 2008). "Roles of distinct glutamate receptors in induction of anti-Hebbian long-term potentiation". The Journal of Physiology. 586 (6): 1481–6. doi:10.1113/jphysiol.2007.148064. PMC 2375711. PMID 18187472. ^ McNaughton BL (April 2003). 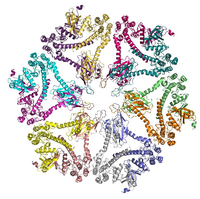 "Long-term potentiation, cooperativity and Hebb's cell assemblies: a personal history". Philosophical Transactions of the Royal Society of London. Series B, Biological Sciences. 358 (1432): 629–34. doi:10.1098/rstb.2002.1231. PMC 1693161. PMID 12740107. ^ Abraham WC (April 2003). "How long will long-term potentiation last?". Philosophical Transactions of the Royal Society of London. Series B, Biological Sciences. 358 (1432): 735–44. doi:10.1098/rstb.2002.1222. PMC 1693170. PMID 12740120. ^ a b c d e f g h Lynch MA (January 2004). "Long-term potentiation and memory". Physiological Reviews. 84 (1): 87–136. doi:10.1152/physrev.00014.2003. PMID 14715912. ^ a b c d Sweatt JD (1999). "Toward a molecular explanation for long-term potentiation". Learning & Memory. 6 (5): 399–416. doi:10.1101/lm.6.5.399. PMID 10541462. ^ Malinow R (April 2003). "AMPA receptor trafficking and long-term potentiation". Philosophical Transactions of the Royal Society of London. Series B, Biological Sciences. 358 (1432): 707–14. doi:10.1098/rstb.2002.1233. PMC 1693162. PMID 12740116. ^ a b Emptage NJ, Reid CA, Fine A, Bliss TV (June 2003). "Optical quantal analysis reveals a presynaptic component of LTP at hippocampal Schaffer-associational synapses". Neuron. 38 (5): 797–804. doi:10.1016/S0896-6273(03)00325-8. PMID 12797963. ^ Frey U, Frey S, Schollmeier F, Krug M (February 1996). "Influence of actinomycin D, a RNA synthesis inhibitor, on long-term potentiation in rat hippocampal neurons in vivo and in vitro". The Journal of Physiology. 490. 490 ( Pt 3) (Pt 3): 703–11. PMC 1158708. PMID 8683469. ^ Frey U, Krug M, Reymann KG, Matthies H (June 1988). "Anisomycin, an inhibitor of protein synthesis, blocks late phases of LTP phenomena in the hippocampal CA1 region in vitro". Brain Research. 452 (1–2): 57–65. doi:10.1016/0006-8993(88)90008-X. PMID 3401749. ^ a b c d e f Kelleher RJ, Govindarajan A, Tonegawa S (September 2004). "Translational regulatory mechanisms in persistent forms of synaptic plasticity". Neuron. 44 (1): 59–73. doi:10.1016/j.neuron.2004.09.013. PMID 15450160. ^ Kovács KA, Steullet P, Steinmann M, Do KQ, Magistretti PJ, Halfon O, Cardinaux JR (March 2007). "TORC1 is a calcium- and cAMP-sensitive coincidence detector involved in hippocampal long-term synaptic plasticity". Proceedings of the National Academy of Sciences of the United States of America. 104 (11): 4700–5. Bibcode:2007PNAS..104.4700K. doi:10.1073/pnas.0607524104. PMC 1838663. PMID 17360587. ^ a b c d e Serrano P, Yao Y, Sacktor TC (February 2005). "Persistent phosphorylation by protein kinase Mzeta maintains late-phase long-term potentiation". The Journal of Neuroscience. 25 (8): 1979–84. doi:10.1523/JNEUROSCI.5132-04.2005. PMID 15728837. ^ a b c Pastalkova E, Serrano P, Pinkhasova D, Wallace E, Fenton AA, Sacktor TC (August 2006). "Storage of spatial information by the maintenance mechanism of LTP". Science. 313 (5790): 1141–4. Bibcode:2006Sci...313.1141P. CiteSeerX 10.1.1.453.2136. doi:10.1126/science.1128657. PMID 16931766. ^ Volk LJ, Bachman JL, Johnson R, Yu Y, Huganir RL (January 2013). "PKM-ζ is not required for hippocampal synaptic plasticity, learning and memory". Nature. 493 (7432): 420–3. Bibcode:2013Natur.493..420V. doi:10.1038/nature11802. PMC 3830948. PMID 23283174. ^ a b Meyer D, Bonhoeffer T, Scheuss V (April 2014). "Balance and stability of synaptic structures during synaptic plasticity". Neuron. 82 (2): 430–43. doi:10.1016/j.neuron.2014.02.031. PMID 24742464. ^ Kang H, Schuman EM (September 1996). "A requirement for local protein synthesis in neurotrophin-induced hippocampal synaptic plasticity". Science. 273 (5280): 1402–6. Bibcode:1996Sci...273.1402K. doi:10.1126/science.273.5280.1402. PMID 8703078. ^ Steward O, Worley PF (June 2001). "A cellular mechanism for targeting newly synthesized mRNAs to synaptic sites on dendrites". Proceedings of the National Academy of Sciences of the United States of America. 98 (13): 7062–8. Bibcode:2001PNAS...98.7062S. doi:10.1073/pnas.131146398. PMC 34623. PMID 11416188. ^ Pavlidis P, Montgomery J, Madison DV (June 2000). "Presynaptic protein kinase activity supports long-term potentiation at synapses between individual hippocampal neurons". The Journal of Neuroscience. 20 (12): 4497–505. doi:10.1523/JNEUROSCI.20-12-04497.2000. PMID 10844019. ^ Zakharenko SS, Patterson SL, Dragatsis I, Zeitlin SO, Siegelbaum SA, Kandel ER, Morozov A (September 2003). "Presynaptic BDNF required for a presynaptic but not postsynaptic component of LTP at hippocampal CA1-CA3 synapses". Neuron. 39 (6): 975–90. doi:10.1016/S0896-6273(03)00543-9. PMID 12971897. ^ Frey U, Morris RG (February 1997). "Synaptic tagging and long-term potentiation". Nature. 385 (6616): 533–6. Bibcode:1997Natur.385..533F. doi:10.1038/385533a0. PMID 9020359. ^ Martin KC, Casadio A, Zhu H, Yaping E, Rose JC, Chen M, Bailey CH, Kandel ER (December 1997). "Synapse-specific, long-term facilitation of aplysia sensory to motor synapses: a function for local protein synthesis in memory storage". Cell. 91 (7): 927–38. doi:10.1016/S0092-8674(00)80484-5. PMID 9428516. ^ Casadio A, Martin KC, Giustetto M, Zhu H, Chen M, Bartsch D, Bailey CH, Kandel ER (October 1999). "A transient, neuron-wide form of CREB-mediated long-term facilitation can be stabilized at specific synapses by local protein synthesis". Cell. 99 (2): 221–37. doi:10.1016/S0092-8674(00)81653-0. PMID 10535740. ^ Segal M, Murphy DD (1999). "CREB activation mediates plasticity in cultured hippocampal neurons". Neural Plasticity. 6 (3): 1–7. doi:10.1155/NP.1998.1. PMC 2565317. PMID 9920677. ^ Straube T, Frey JU (2003). 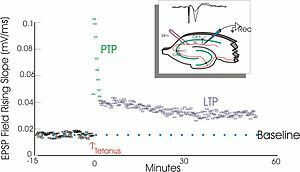 "Involvement of beta-adrenergic receptors in protein synthesis-dependent late long-term potentiation (LTP) in the dentate gyrus of freely moving rats: the critical role of the LTP induction strength". Neuroscience. 119 (2): 473–9. doi:10.1016/S0306-4522(03)00151-9. PMID 12770561. ^ Lu YF, Kandel ER, Hawkins RD (December 1999). "Nitric oxide signaling contributes to late-phase LTP and CREB phosphorylation in the hippocampus". The Journal of Neuroscience. 19 (23): 10250–61. doi:10.1523/JNEUROSCI.19-23-10250.1999. PMID 10575022. ^ Frey U, Matthies H, Reymann KG, Matthies H (August 1991). "The effect of dopaminergic D1 receptor blockade during tetanization on the expression of long-term potentiation in the rat CA1 region in vitro". Neuroscience Letters. 129 (1): 111–4. Bibcode:2006NeuL..400..197D. doi:10.1016/0304-3940(91)90732-9. PMID 1833673. ^ Otmakhova NA, Lisman JE (December 1996). "D1/D5 dopamine receptor activation increases the magnitude of early long-term potentiation at CA1 hippocampal synapses". The Journal of Neuroscience. 16 (23): 7478–86. doi:10.1523/JNEUROSCI.16-23-07478.1996. PMID 8922403. ^ Morris RG, Anderson E, Lynch GS, Baudry M (1986). "Selective impairment of learning and blockade of long-term potentiation by an N-methyl-D-aspartate receptor antagonist, AP5". Nature. 319 (6056): 774–6. Bibcode:1986Natur.319..774M. doi:10.1038/319774a0. PMID 2869411. ^ McHugh TJ, Blum KI, Tsien JZ, Tonegawa S, Wilson MA (December 1996). "Impaired hippocampal representation of space in CA1-specific NMDAR1 knockout mice". Cell. 87 (7): 1339–49. doi:10.1016/S0092-8674(00)81828-0. PMID 8980239. ^ Whitlock JR, Heynen AJ, Shuler MG, Bear MF (August 2006). "Learning induces long-term potentiation in the hippocampus". Science. 313 (5790): 1093–7. Bibcode:2006Sci...313.1093W. doi:10.1126/science.1128134. PMID 16931756. ^ Bliss TV, Collingridge GL, Laroche S (August 2006). "Neuroscience. ZAP and ZIP, a story to forget". Science. 313 (5790): 1058–9. doi:10.1126/science.1132538. PMID 16931746. ^ Cooke SF, Bliss TV (July 2006). "Plasticity in the human central nervous system". Brain. 129 (Pt 7): 1659–73. doi:10.1093/brain/awl082. PMID 16672292. ^ a b Rowan MJ, Klyubin I, Cullen WK, Anwyl R (April 2003). "Synaptic plasticity in animal models of early Alzheimer's disease". Philosophical Transactions of the Royal Society of London. Series B, Biological Sciences. 358 (1432): 821–8. doi:10.1098/rstb.2002.1240. PMC 1693153. PMID 12740129. ^ Crary JF, Shao CY, Mirra SS, Hernandez AI, Sacktor TC (April 2006). "Atypical protein kinase C in neurodegenerative disease I: PKMzeta aggregates with limbic neurofibrillary tangles and AMPA receptors in Alzheimer disease". Journal of Neuropathology and Experimental Neurology. 65 (4): 319–26. doi:10.1097/01.jnen.0000218442.07664.04. PMID 16691113. ^ a b Kauer JA, Malenka RC (November 2007). "Synaptic plasticity and addiction". Nature Reviews. Neuroscience. 8 (11): 844–58. doi:10.1038/nrn2234. PMID 17948030. ^ Wolf ME (August 2003). "LTP may trigger addiction". Molecular Interventions. 3 (5): 248–52. doi:10.1124/mi.3.5.248. PMID 14993438. Bliss T, Collingridge G, Morris R (2004). Long-term potentiation: enhancing neuroscience for 30 years. Oxford: Oxford University Press. ISBN 978-0-19-853030-5. This page was last edited on 24 February 2019, at 15:22 (UTC).